Free form capabilities offer a level of detail and customization that is truly revolutionary. MJ Optical’s free form capabilities utilize computer-driven design and surfacing tools to accurately optimize the lens surface. Using free form digital lens surfacing equipment, MJ Optical technicians can customize high-definition eyeglass lenses with your customer’s unique prescription. Free form digital lens surfacing is a revolutionary breakthrough for vision correction. A number of data points are collected on each eye to not only account for the refractive error, but also the unique variations in the shape and surface of the eyes. Our highly skilled optical engineers create ultra-smooth transitions and lens designs using free form software programs that optimize each point on the lens. The resulting prescription provides the best balance of vision and a perfectly customized, high-definition progressive. Your order of lenses is created on a computer-driven, free form generator. The generator can read and respond to high-tech prescriptions written to 1/100th of a diopter. Customized measurements ensure that your customer’s prescription will be as clear as it was meant to be. Traditional progressive designs require glass molds to create a fixed, front-surface on the lenses. However, free form surfacing technology eliminates the need for a mold by simultaneously cutting the progressive design and prescription on the lens surface. The result is a perfectly tailored prescription lens order for your customer. Contact MJ Optical to learn more about our free form capabilities. We take great pride in the wholesale optical lab services we offer. 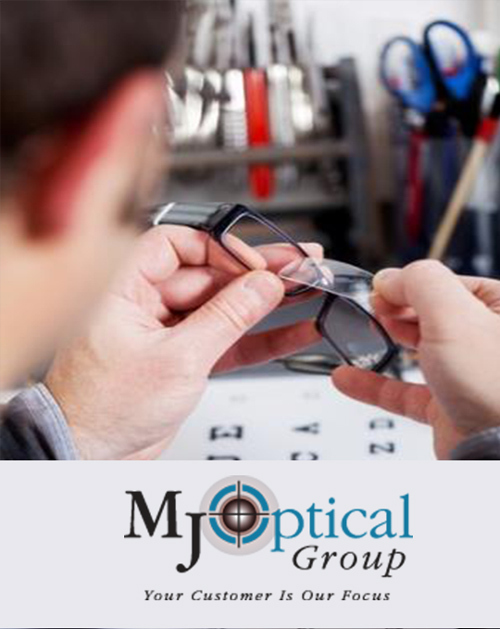 At MJ Optical, our skilled technicians utilize state-of-the-art surface and finishing labs and an Anti-Reflective facility to complete your eyeglass lens orders accurately, quickly, and at a fair price. Call 1-800-634-9461 to set up an account today.